It has been noted before in some of the logs for caches in Gävle that the average Gävle cacher must be about 2.20 m tall if cache placement is anthing to go by. One of my best aquisitions in the last year has been a telescopic ladder. I bought the 3.2 m ladder from Biltema for just a few hundred crowns. I have seen the caches Gefle Volleyboll and Boulongerskogen from ground level and realised that their z-axis position was way above my grasp. There was only one course of action and that was to grab them with the help of the ladder. Now, the interesting thing about the entrance to Boulongerskogen is that it is next to traffic lights on what is possibly the busiest road into Gävle, which means that cache retrieval is best done late at night or early morning. I chose early morning and had a “little helper” with me. 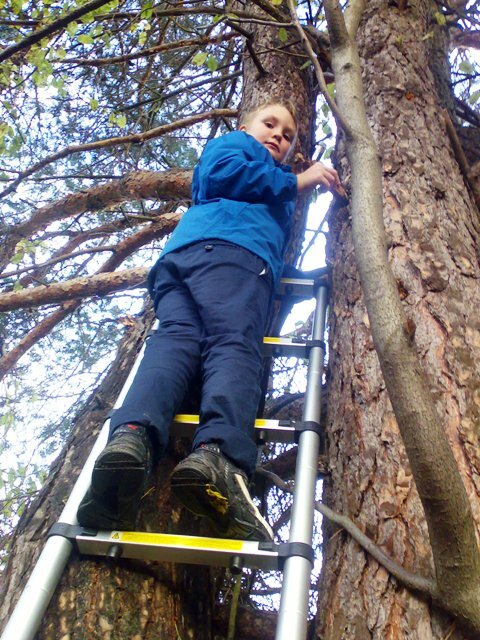 Leon has been geocaching since he was seven months old and of course at eight he is perfect for helping out with those “slightly inaccessible “caches that turn up. He shot up the ladder like greased lightening and retrieved the caches in no time at all.